The ATA® is committed to supporting research into better ways to diagnose and treat thyroid disease. 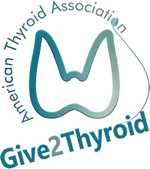 The generosity of members, patients, industry, and donors in the workplace has enabled the ATA® to award 99 thyroid research grants totaling over $2.6 million since the inception of the Research Fund. The following represent thyroid-related publications from all ATA-supported grant recipients, arranged by the year the award was made, covering the five year period following the award.